Making a new flooring decision can be difficult. There are so many different types of flooring, from carpet to hardwood and tile to laminate. Figuring out where to start is often the hardest step. That’s where the help of mom-turned-design blogger Jessica Kielman comes in! She recently went through a big flooring change in her home and could not be happier with the result. The solution? Laminate. It has the classic, attention-grabbing aesthetic of hardwood with more durability and cleanability than carpet. Laminate is perfect for the fashion-forward family with rambunctious kids, pets or a combination of both. Not only does laminate look as good as hardwood flooring, it’s much cheaper and can really benefit a family on a budget. Laminate is the perfect hybrid of style and performance. It comes in a number of different styles, textures and colors and is extremely strong and durable; perfect for any age kids or pets. 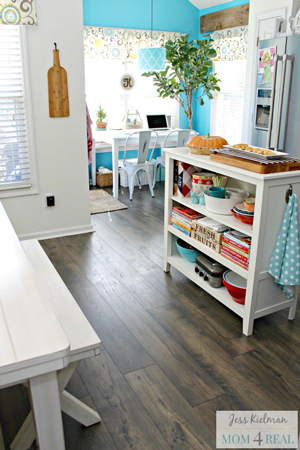 Laminate is spillproof and easy to clean with anything from vacuums to wet-jet Swiffers. It also holds up against wear and tear and can complement any décor. That brings us to the next step in the flooring-decision process: selecting a style and color. Jessica did some research as well as visited her local retailer to narrow down her choices. She wanted something stylish with a rustic feel. The advantage of laminate is the wide variety of selection. If you can think of a style or a color, you are more than likely going to find something close or identical to your vision. Once she’d done a little research, Jessica went to her local flooring retailer to check out samples and gain more insight. There are so many advantages to going to a local retailer. Unlike the big box stores, your local retailer specializes in flooring, so they are going to know every detail of their products. They can listen to your vision and narrow down the selection so you can take home samples and visualize how the laminate will look in your space, or in Jessica's case, her entire home. Move your furniture out of the way. Let the installers demo your old floors and put in your new floors. It’s that simple! The amount of time or days it will take all depends on the size of the project. In Jessica’s case, the installers had to demo the old flooring in the entire house. But after a few days, Jessica’s home was done, and the results were amazing! You can’t tell if the floor is laminate or high-end vintage hardwood. It’s beautiful. Laminate flooring is truly the hybrid of all flooring types. It is strong and durable with endless color and texture options. It can make any space look great, and it performs in any room of your home. If you think laminate is the floor for you, visit us today to see it in person.